Day games after night games have a reputation for not being too popular among players, and I imagine that’s especially true when the day game starts before noon, rather than after it. For me, this type of scheduling scenario is a treat. While I’ll admit that having fewer than 12 hours elapse between leaving the ballpark after a night game and returning before the next day’s game is a little exhausting, it’s always a situation I enjoy on my road trips. 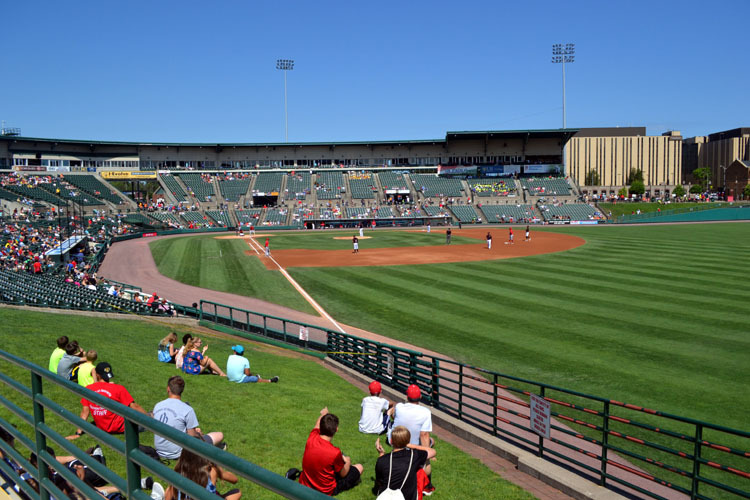 After a full — and filling — first day at Rochester’s Frontier Field, I crashed in my hotel less than a half mile away, but was up bright and early on the morning of July 17 for some day baseball. The Red Wings were playing at 11 a.m. to accommodate a bunch of summer camps that would be in attendance, so I was expecting a boisterous atmosphere. 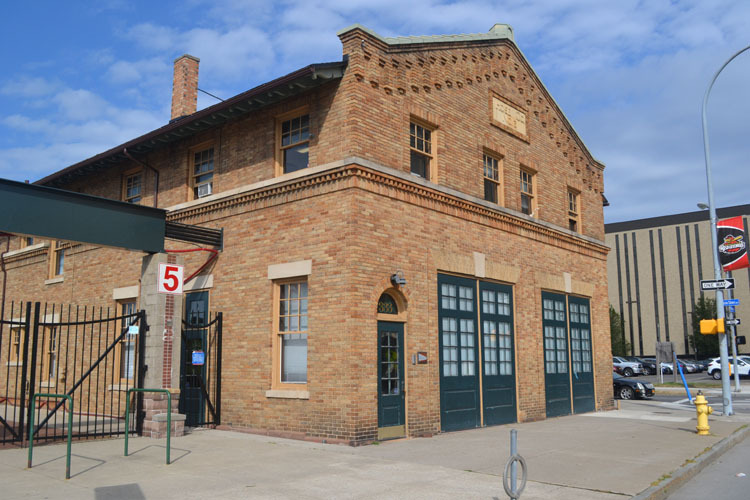 If the building looks like a historic firehouse, you’re absolutely right. Home to “Hose Co. No. 3,” this building opened in 1934. 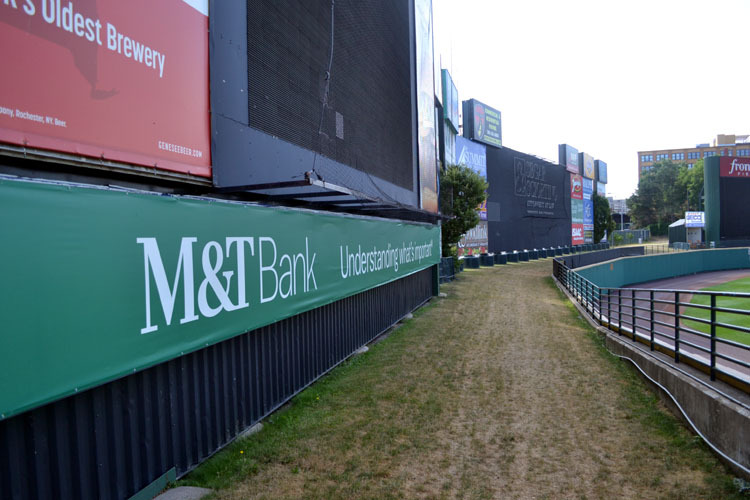 I think it’s outstanding that it was not only kept during the construction of Frontier Field six decades later, but also included in the design. 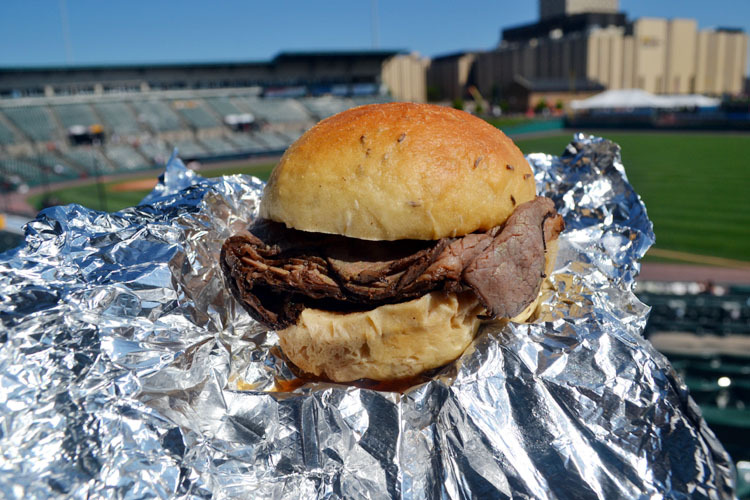 While there are certainly flashier concession items both at Frontier Field and ballparks across the minor leagues, I love this sandwich because it’s exactly what you want it to be — a fresh kimmelweck roll topped with caraway seeds and kosher salt, a heaping pile of thinly sliced prime rib and plenty of au jus. In fact, you can see the latter floating in the tinfoil below the sandwich. I always add some horseradish to my sandwich, which adds another flavor dimension that I like. As always, the sandwich was outstanding. 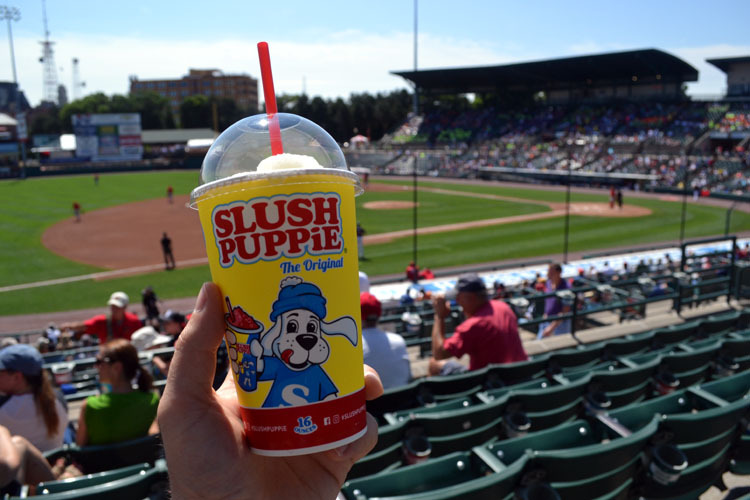 It’s a must-have item for anyone visiting Frontier Field. I always wish I could buy 10 of them and jam them in my suitcase to take home with me. For the record, the park looks fairly empty in the image above. What you’re not seeing, however, is that the stands just out of sight to the left were absolutely packed. Because of the overhang providing shade, most of the camp groups bought tickets in those sections, so the upper deck on the first base side was definitely a lively place to be all game. I ended up spending the remainder of the game in that spot. 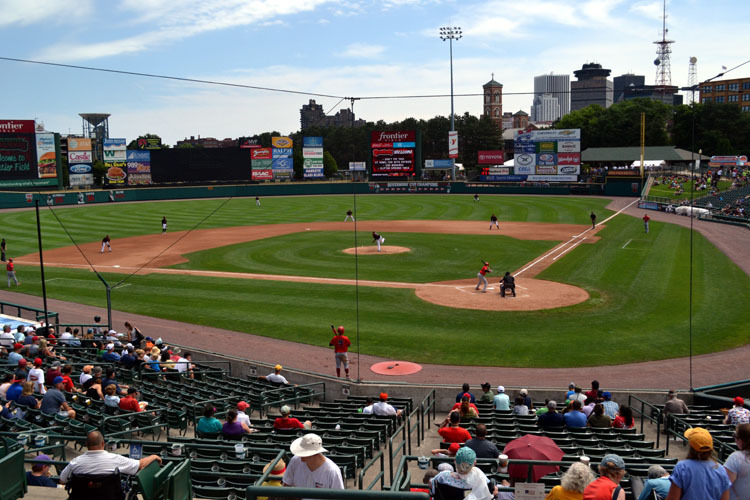 I didn’t have any desire to be in the sun any longer, and with another visit to Frontier Field coming up in a little more than 24 hours, it was time to just kick back and enjoy the ballgame. 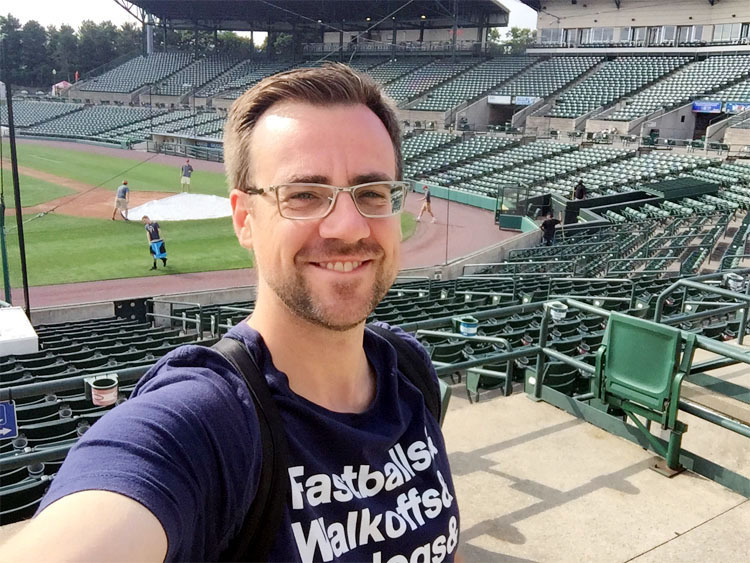 Unlike a day earlier, I wasn’t in a rush to get out of the ballpark, and that meant that by the time I got to my car, there were a handful of cars in front of me. Happy to blast the A/C and wait my turn, I had a classic “only in the minors moment.” While I sat in the line, I saw a Red Wings pitcher Gabriel Moya walk through the parking lot and get into his vehicle — a white Range Rover Velar, if you’re wondering. I normally have trouble identifying minor leaguers when they’re not in uniform, but I’d watched him throw in the bullpen a day earlier and found that he was easy to recognize. The left-hander, who has since been called up to Minnesota, sat in his car like any other Frontier Field visitor, eager to get moving. As I inched closer, I was eager for the opportunity to wave him forward, but the driver immediately ahead of me must’ve had the same idea. He motioned for the Range Rover to proceed, and Moya slid into place and disappeared into the traffic a couple of minutes later. For me, meanwhile, it was another short jaunt back to my hotel room for some much-needed air conditioning, then a quick jaunt out for a steak for dinner, and then back to my hotel to watch the MLB All-Star Game on TV.